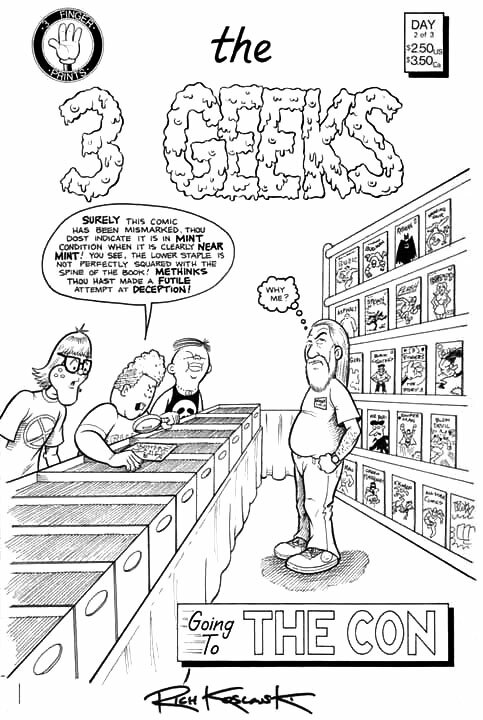 At HighGradeComics.com my goal is to give my customers a very extensive and well graded inventory of high grade comics. With over 36,000 books currently on-line I cover multiple genres and ages. I have garnered a respect in this business by helping collectors determine the value of the books they own, find the books they want and sell the books they no longer need. Solid grading, finding the tough book and the reputation of doing the right thing is something I am very proud of. I'm not the cheapest and I'm not the most expensive. While I would love to have the "right" price for every pocketbook that isn't realistic. I believe that everyone in this hobby wants to be treated fairly so if you expect that of me when selling you something you better assume I do the same when buying books from others. All of my books on this site can be bid on so it doesn't hurt you to make an offer. As I've said I will work with you if you will work with me. I believe in long term buyer/seller relationships. If I can give you a good deal I will, if I can't I will tell you that. While everyone uses the "Grading is subjective statement" the bottom line is that the Overstreet grading guide is not interpreted the same way by every collector/dealer. Every dealer and frankly many collectors have their "personal perk list" of defects they are hard on and defects they overlook/minimize. A dealers grading is defined by the people who taught them and the feedback they get from their customers. If they are lucky they will get honest assessments and hopefully get better the more they grade. However as we all know not everybody gets better over time and the need for third party grading becomes evident. As the marketplace accepted third party grading transactions became easier and frankly came down to price. Time wasn't wasted arguing over who was the better grader. Every PGX book on my site was graded by the owner that sold them to me. My honest assessment of them is that I am more confident in CGC's restoration check than PGX's. As far as grading goes I have seen both companies inconsistency. Some of you will notice that there is a CGC Charter Dealer logo on my home page. I am a dealer authorized to submit books to Comic Guaranty Corporation. I do not work for or grade their books. Since CGC graders and I did not attend a grading college I CANNOT guarantee that a non certified book I sell you will be graded the same way by CGC. What is not left to interpretation is that I will honor all returns if a book I've sold you comes back restored. HighGradeComics.com has ALWAYS had a NO time limit guarantee that your money would be refunded in the event a book comes back restored. We will now take the further step of extending this to CGC graded books as well. Any book, sold in an unrestored CGC holder by HighGradeComics.com that is later determined by CGC to actually contain restoration not discovered in the previous certification, will be fully refundable. This policy will be retroactive to any CGC books sold by HighGradeComics.com in the past. No if and or buts. If you register on my site the idea that preferred customers get "first shot" is no longer a factor. As new arrivals come in you will be notified by email that a book on your list is in. As always, there is no obligation to buy and you can control if you want to be notified or not. The ability to do this is right under the New Arrivals heading. Message looks like - You are subscribed to our nightly new arrivals e-mail bulletin. To unsubscribe, click here. In addition to the automatic want list feature immediately showing you the books I currently have in inventory we just added a traditional Book finder feature. Search by Title, Grade, Publisher, Pedigree or even by price range. What's even better about this book finder feature is that in addition to finding the books you want you can also generate a wish list to send your friends and family as gift ideas! If you need additional information about the website click on this link to the How to Order page. Many customers ask if I'm on eBay. Yes I am, I have an eBay store that contains a few of my more expensive books. You will save more money bidding in my site versus buying the book from my eBay store. Everything in the eBay store is in my site. Feedback is welcome on the functionality of the site. In addition if there are titles/issues (such as 80/90/2000+ stuff) you are looking for but can't find please let me know. It's very hard to keep up with all the new collecting trends so I appreciate your input. Please email suggestions to bobstorms@highgradecomics.com. Thank you!